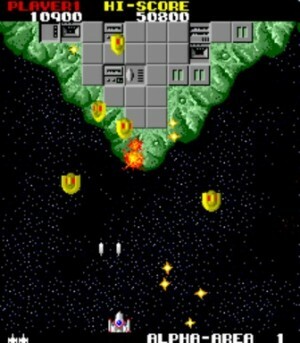 A single player, vertically scrolling shoot-em-up in which the player pilots a spaceship over series series of islands – drifting in outer-space space – shooting enemy spacecraft and ground-based targets. Special symbols appear at regular intervals and can be shot or collected for bonuses and power-ups. Each level has an end-of-level boss that must be defeated before the player can progress to the next level, while the levels themselves are designated by letters of the Greek alphabet.